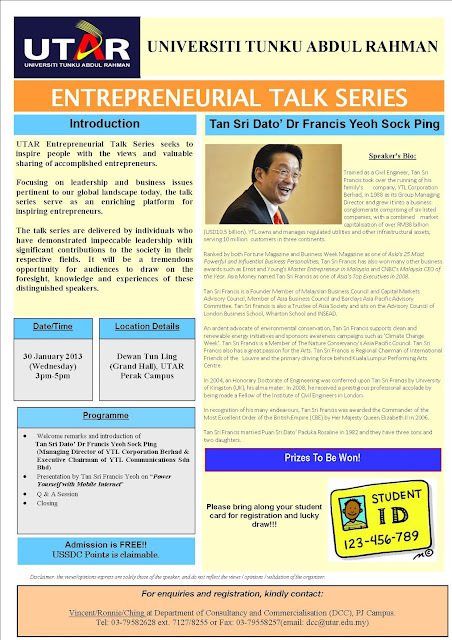 Department of Consultancy & Commercialisation (DCC) is pleased to invite all UTAR staff and students to attend the "Entrepreneurial Talk Series" by Tan Sri Dato' Dr Francis Yeoh Sock Ping, Managing Director of YTL Corporation Berhad & Executive Chairman of YTL Communications Sdn Bhd. Please bring along your student card for registration and lucky draw! !